Discussion in 'iPad Accessories for iPAD 1, 2 and 3' started by 4phun, Apr 13, 2010. 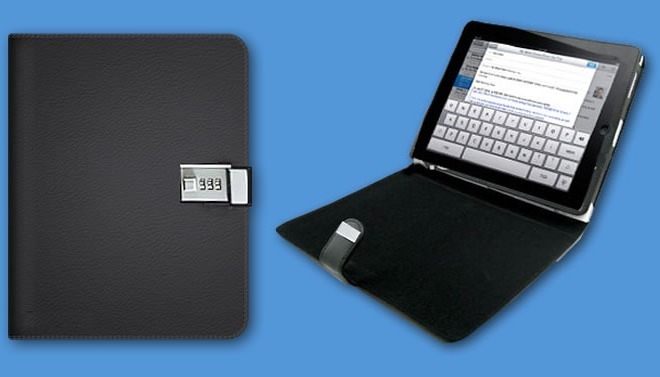 The Security Case for the iPad is a folio-style leather folder for the iPad. As a simple flip-open case it is fine, if expensive at $45. But its standout feature â€“ security â€“ is an almost willfully absurd duplication of something the iPad already has: a PIN-protected lock. Like the iPhone, the iPad requires a four-digit PIN to unlock it (if you activate it). The â€œSecurityâ€ Case has a three-digit combination to stop you opening the clasp, which is of the same design as youâ€™ll see on the locking diary of a tween-aged girl, on on the briefcase of a middle-aged middle-manager. If that doesnâ€™t ring a bell, it looks like the kind of lock which can be popped in seconds with the help of a small blade. Worse, the port is still exposed. This is touted as a feature: You can charge the iPad while it is locked up. But it also means that anyone can gain physical access to your machine, plug it into another computer and wipe your data. Thatâ€™s not so secure. Still, there is one thing that this case can provide. The iPad can display a slideshow of your photos when locked. If you have foolishly decided to run the album featuring those â€œcheekyâ€ photos of your better half on your screensaver, then this just may save you some office embarrassment. Available now.